We decided a while ago not to draw attention to every “teaser” released by a motorcycle manufacturer in anticipation of a new model. Don’t expect that to change. There are just too many. We do report rumors, however, from time-to-time, and this looks like this has gone beyond the rumor stage. Expect Ducati to announce one or more new models falling within its Scrambler family on November 16 in Milan. Scrambler social media sites are hinting at at least one new member of that family, which currently consists of the Scrambler Icon model we previously tested and its 803cc v-twin siblings, the Full Throttle and the Urban Enduro. The current Scrambler models are selling well, and we expect the new model, or models, to fall in at a lower price point and lower displacement (perhaps, in the form of a single cylinder engine). The “Bart and Betty” promotion and the “Low Speed Excitement” video posted below apparently relate to this rumor. Since we are already able to identify several of the nine new models Ducati says it will unveil on November 16, much of the pizzazz associated with that unveiling has been lost. If Ducati would build a big desmo single with the power output of the KTM 690 and put it in the Scrambler platform….that would be sweet! It did look like a commercial for eyeliner. You’re slipping, Dirck. I believe the correct term is “Scrambler Ducati(s)”, not Ducati Scramblers. You Californians are supposed to on it with this political correctness stuff. So silly. Ducati’s marketing department seems to be having a bit of a crisis concerning what to do with this bike and what it should mean to people. Disclaimer: The Enduro/Scrambler/Retro stuff is fine, and this particular specimen is pretty, sounds right, has enough power and Duc is making a lot of money while buyers are happy. “what to do with this bike and what it should mean to people”, they probably should do nothing, this is not a scrambler is it? it not more road worthy more than the 600 pounds adventure bikes, I think this is the crossover of the bike industry, a generic bike that people buy by how it looks; and the perfume-video comments are spot on my opinion, they are trying to sell an experience (which is fine, many people buy things by how they look and is perfect, I mean who can argue against a gullwing Mercedes?). They will probably release the same package with one or more of the already existing engines. “Scrambler Ducati(s)”, not Ducati Scramblers” this is because the editor position was just for California right?. Maybe VR46 will just pass the whole field and take the win! A 696 Scrambler would be 40 + pounds lighter, 80hp w/ 50 ft lbs of torque. A big single would have to be in the 650 range. My money’s on a 696. The 696 Monster weighed only a few lbs less than the 796 if I remember correctly. I wouldn’t expect 40 fewer lbs. Ducati used to build dirt bikes and DP bikes many years ago. Perhaps they’d like to get back into the small bike market. Not a bad idea. Less than zero interest in ths smaller-entry level Ducati. I am interested in a Cafe’ Twin, 900-1200cc air cooled. Metallic large flake silver in color. trellis frame. Bring back the CR. Wow, that’s a killer view of that bike. Did not ride the Scrambler, but did ride (and loved) the mid 2000 Monster S2R with similar/early version of the same 803cc motor. From my reading the Scrambler top end might be a little softer. If correct, my best guess is Ducati polished the head less to save money. The S2R is not a power house by any stretch, but I’d not characterize the top end as soft. Of all Ducati motors, my all time favorite is the liquid cooled mid-800cc Hypermotard’s. I very much like the idea of less reciprocating mass, and this motor makes plenty of top end power for my purposes. I’d like to see a restyled scrambler from Ducati. Give it a little character…more rough and tumble styling, and put whatever engine you want in it as long as it isn’t too big. I really like the Scrambler, but was hoping they decided to put a larger motor from the Monster line in it. A 1,200 cc air cooled scrambler sounds about right. That sounds just about right to me. My dealer told me not to expect a larger air cooled engine in this bike. The 1100 EVO was removed from the line because it could not meet emissions and with further tighter emissions standards coming it doesn’t look good for large displacement two valve air cooled engines. My dealer actually told me the same thing. He said they would either have to detune the engine quite a bit (like they did with the 800 in Scrambler vs. the Monster) or redesign it completely. I have heard and read the same thing. I am not sure that is a bad thing though. I am thinking that the 1100evo engine might be a little too brutish for a scrambler configuration. One of the few instances where you’ll see me disagree with the phrase “too much is just right”. I own an 1100evo Hyper…..it regularly scares the bejeezus out of me! I always wished for more power. To each his own! I am even less interested in a smaller version. 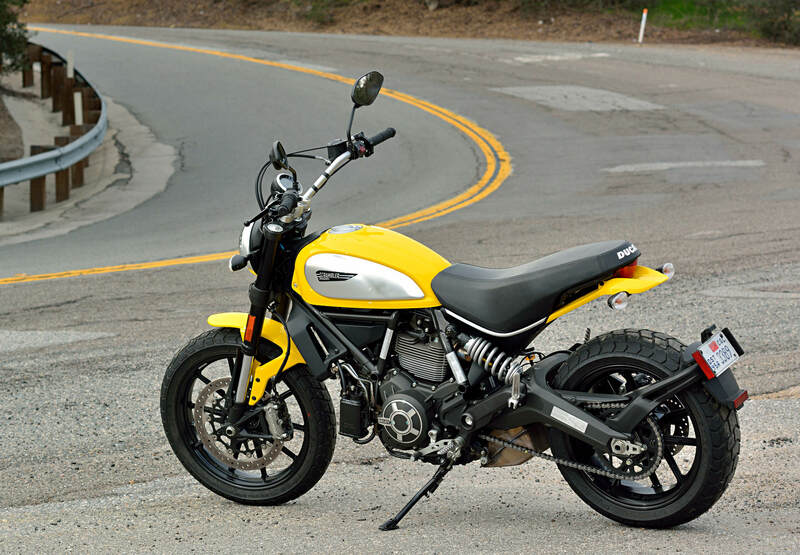 But many people who ride off-road, and do not just want a street bike with scrambler styling, might welcome a lower displacement, lighter Ducati Scrambler. Could it be as simple as losing the vertical cylinder? Imagine a 400-500cc single cylinder scrambler that weighs fifty pounds less and sells for about 5K. That would be an awesome entry level option as well. I got absolutely nothing from that commercial. It could have been for perfume for all I know. Didn’t watch it. I’m so tired of those ridiculous new bike “teasers” that I don’t even hit the play button anymore. 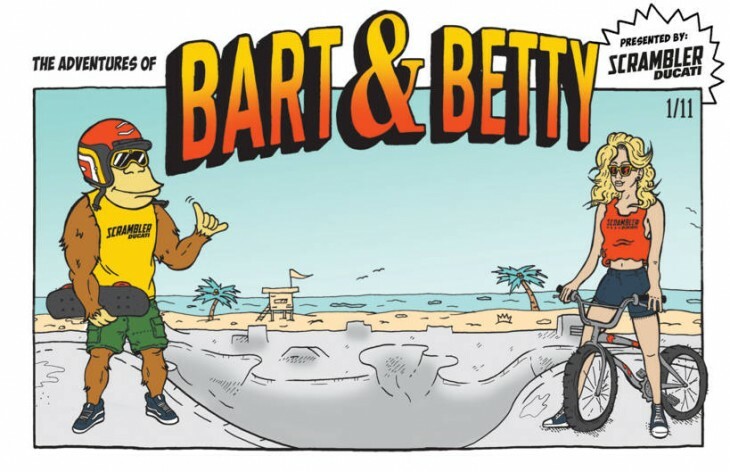 I like the Scrambler a lot; but after casting my eyes on that stupid “Bart & Betty” thing (nope, didn’t bother to click on it either), I don’t think I want one anymore. There is power in advertising after all, I suppose. A 650 single would be good. Keep the body the same. I dunno, yeah maybe the ’74 and later Enduros but not the ’68 thru ’73 models. Google 1970 RT1 and think it over. Oh yeah, forgot how nice that yellow one looked. Good catch. Also, you really could ride the enduros off road. At first glance its appearance seemed to be that of an older Sportster to me. I haven’t been well. A 400 single would be nice. Just look at how successful all the versions of the Suzuki DRZ400 has been. Single…hmmm…that would be low speed excitement. 696? Nah….that would be too easy.